Today we went looking for good spots to activate the Great Otway National Park, VKFF-405. 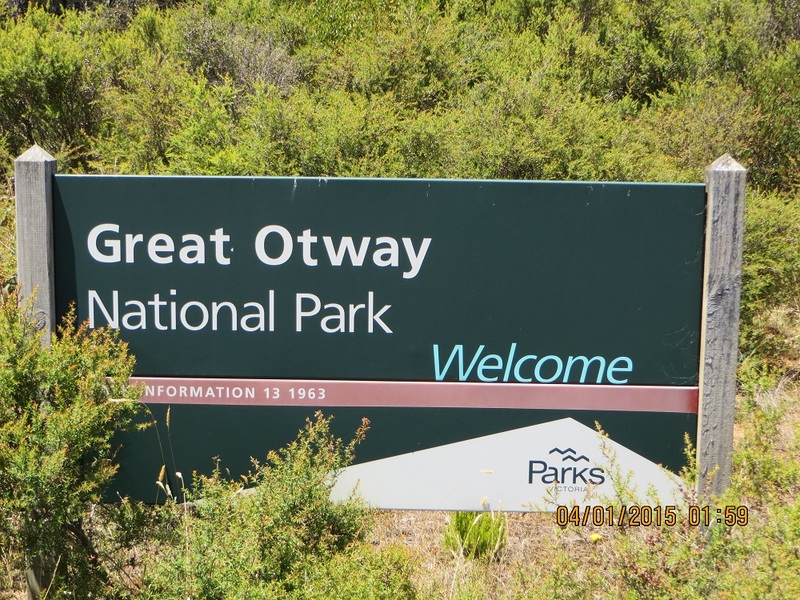 The Victorian Government Park’s brochure describes the Great Otway National Park as new. It was formed as recently as 15th September 2005, and is a creation from a number of pre-existing parks. The Park’s brochure (in two separate sections) one for the Western part of the Park (Kennett River to Princetown) and one for Eastern part (the section Torquay to Kennett River) clearly shows a patchwork of land-holdings. Even a cursory glance of the brochures will show that the Park is made up of various parcels of land, many unconnected, and with privately held land within the Park. It is a large Park with many great features and we did not have time to explore it in any depth. However, we were able to gain some appreciation of its size and the agricultural interests pursued along side of the Park. A large double-trailer milk truck truck was doing the rounds. There were also some vineyards and general cropping and grazing activities. We drove from Port Campbell along the Great Ocean Road to the Gelibrand River Road and turned left and travelled on a gravel road for about 16 kilometers to a junction. At the junction we took the Road to Colac for about five kilometres to a spot where we thought I could activate the Park in relative peace. Here are the coordinates: S 38 36.645 and E 143 19.681. Unfortunately I could only gain nine contacts. So after lunch we travelled back to the junction and took the Cobden Road to Simpson and, with a bit more exploring, we found another block clearly identified as part of the Park. I found a great spot off the road which enabled me to gain a few more contacts. There were power lines near by. I took a look at theses lines. The HT lines looked in good condition and the insulators were substantial. As it turned out the power lines, while creating some noise, did not create too much of a problem. I was able to increase my qso numbers to get across the line for the VKFF award. It was a relatively peaceful day on 40 metres as a glance at Portable Amateur Radio Spots will show. I did a lot of listening and signals generally were not strong. Amateurs who enjoy portable operations must have decided after the last few days of frenetic activity to make Sunday a day of rest! Perhaps the weather also contributed to the apparent lack of signals! I worked the following stations: 23:37, VK5YX, Hans conducting the WIA call-back on 7.135 MHz; VK1DI/P1, Ian on VK1/AC-042; VK1NAM, Andrew at home (amazing! ); VK3EK, Rob (what a great web-site he has! ); VK3FPSR, Peter; VK5YX, Hans, for a bit of a chin wag about the fires in the Adelaide Hills; VK5IS, Ian, with an amazing QRP signal as always; VK7PAK/P7, Kerry camping at Cape Portland, not too far away from Mount William National Park see https://vk5bje.com/2014/02/23/mount-william-national-park-22nd-23rd-february-2104/ ; VK3TKK, Peter, QRP, with FT817; VK3UCD, David, also QRP with an FT817; VK3FRFD; VK3VBI, Rod at Warrnambool; VK3FAFK, Mick at Stawell and VK2HFX, Frank on the River Murray. Fourteen contacts were made from 23:27 to 00:15 and from 02:23 to 02:37. All contacts have been uploaded to LOTW and my log can be seen at HRDLOG. Thanks to all of the amateurs who gave me a call.